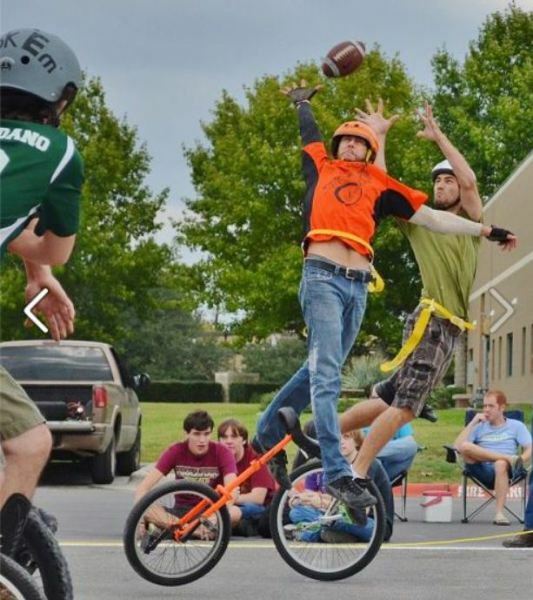 Unicycle Football is the art of playing American football whilst riding a unicycle. The sport is played in San Marcos, Texas where 8 teams of 5 gather every Sunday to take part in a 56 match season. Each match begins with a unicycle joust in place of a coin toss to see which team starts the match in posession of the ball. A “multipurpose-use UFL stick” is used during the jousting and riders must continue to joust even once they have dropped the stick until only one rider is left on their unicycle. Each rider wears a flag around their waist in order to tackle each other safely. Once the flag has been removed by another player, posession of the ball is lost to the opposing side. This practise is known as 'Flackling'.